This Elgin is for sale over on MWR. It caught my eye as it still has most of the black coating and it looks like the hour markers have been lumed. 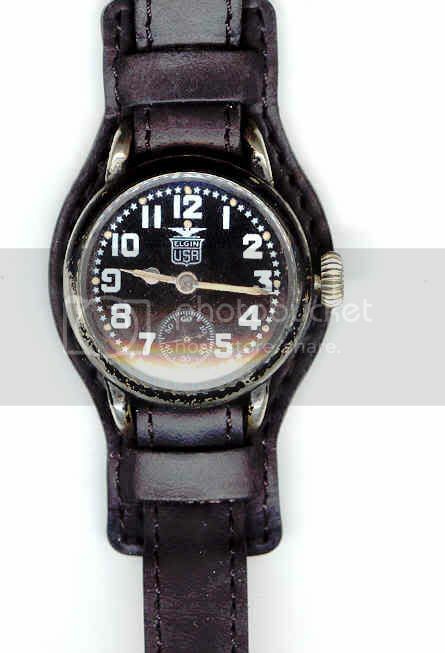 As far as i can recall, the military lumed the dials of these - often by chipping a small hole in the dial and filling it with lume - and some were used right up to and during WW2. Here's the description: "A nice 1918 Elgin Pershing. Case is an Illinois, nickel with screw down bezel and back. Watch looks like it has original black baked on enamel on the bezel and back (some worn off from wear)The crystal looks to be the original thick glass. Watch has had a COA within the last year. Comes with black band in picture. $225.00 plus 3% payPal and $10.00 shipping in lower 48. Will ship overseas at cost". I all ready got one that is a great price for one and the seller repairs watches so it comes with a service and that alone will save you money.